National Student-Athlete Day is celebrated throughout the months of March and April at NCAA (National Collegiate Athletic Association) colleges and universities. The observation of National Student-Athlete Day, started in 1987, by recognizing the accomplishments of student-athletes who excel in the classroom, the play-field and in community services. The celebration provides an opportunity to recognize the outstanding accomplishments of student-athletes. The program seeks to encourage families, schools and communities to support student-athletes in their endeavors. More than 460,000 NCAA student-athletes – more than ever before – compete in 24 sports every year. Member schools support their student-athletes’ academic success by providing state-of-the-art technology, tutoring and access to academic advisors. More than eight out of 10 student-athletes will earn a bachelor’s degree, and more than 35 percent will earn a postgraduate degree. 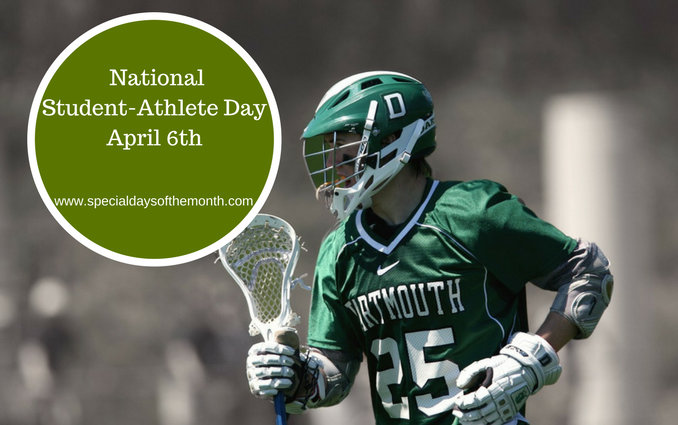 When is National Student-Athlete Day? How is National Student-Athlete Day Celebrated? Have your school host youth clinics, honor athletes for academic accomplishments, speaking engagements, and other local outreach initiatives. Invite eminent athletes and sports personalities to institutions where they share their personal experiences to motivate the student-athletes. Some High Schools have an official signing day, where students who have been accepted to colleges on an athletic scholarship will sign the paperwork. National STUDENT-Athlete Day was created by the National Consortium for Academics and Sports (NCAS) with partnership from the NCAA and the National Federation of State High School Associations. NCAA involvement began in 1994.NCAA member institutions are encouraged to recognize outstanding student-athletes and to make National STUDENT-Athlete Day a meaningful experience by placing posters around their campuses and participating in community activities.